I know, I know - it looks scary. But it's not, I promise. It's actually pretty darn cool! When I opened my mascara, the first thing I thought was along the lines of "it's actually quite cute and dainty!". 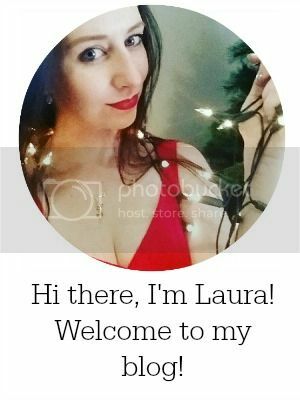 To me, the marketing photos made it look really intimidating, but it's not really. 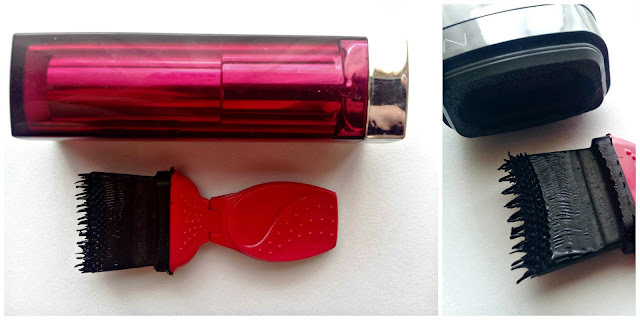 For perspective, I photographed the little paddle alongside a lipstick tube to show its size. 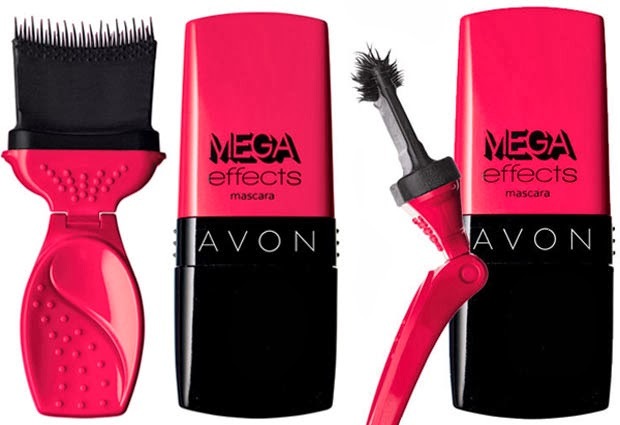 Now, I know - that applicator brush looks unlike anything you've ever seen before! Where/how do you even use it? 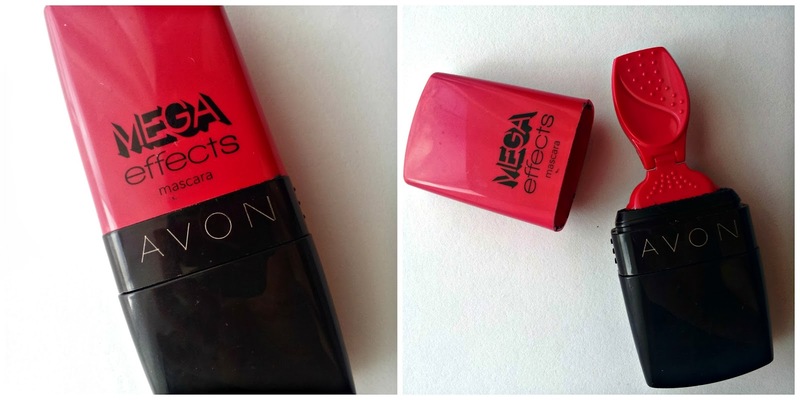 Just for comparison, I've photographed the Avon Mega Effects brush next to an ordinary, run-of-the-mill mascara brush. 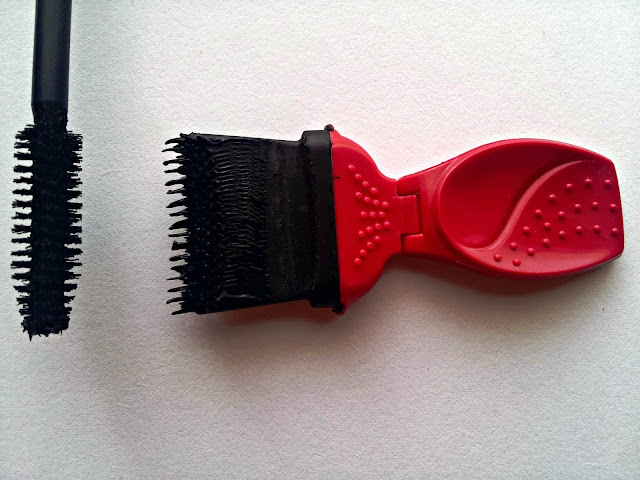 See how it's basically the same - the applicator brush is just on the end of a paddle instead of a wand. The Avon brush has spikey plastic bristles. The mascara comes with a convenient package insert that shows you exactly what to do, so don't worry - you don't need to figure it out on your own! The applicator also has the nifty trick of being able to bend, so you can change the angle to whatever is the most comfortable for you. What does this mean for your mascara application? Well, firstly, you're approaching your lashes from a different angle. 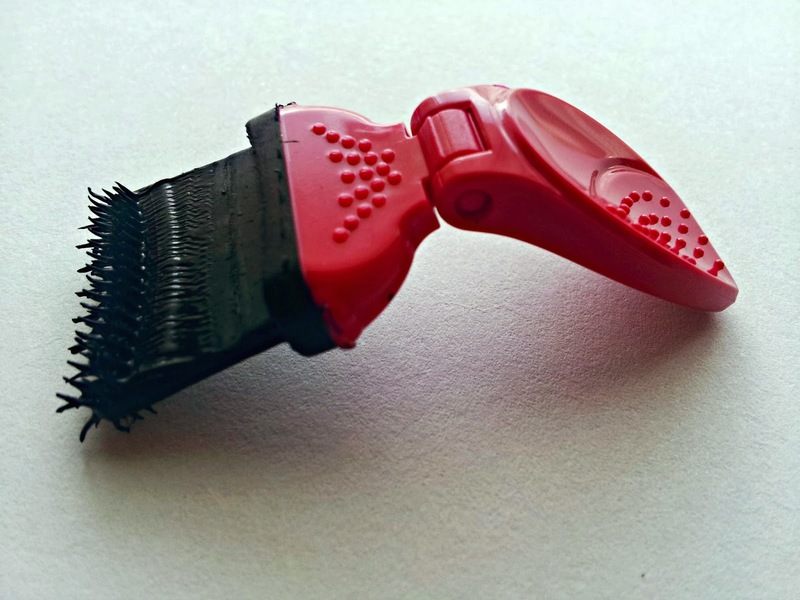 Secondly, the bendable applicator means that you can get right underneath the lashes to coat even the base of the hairs. If you're not familiar with the concept of mascara stamping, go pop over to The Beauty Department to read their post on the idea. Basically, by "stamping" mascara at the roots of the lashes, you add the appearance of volume without having to get your lashes all clumpy. I love this, because (a) I have rather sparse lashes and (b) I absolutely hate when the few lashes I do have clump together, making it look like I have 4 lashes like a cartoon character. For me, this mascara ticks all the boxes. It stays put on your lashes all day without making them too stiff or crunchy. It provides decent definition and volume without clumping. The unique applicator is easy to use and the change in the way you approach the lashes to apply mascara means that you can get right down to the base of your eyelashes. And, being a bit gadgety, it made using the product a really enjoyable experience! PS Wanna see the super easy trick to removing 100% of water-resistant eye makeup with zero scrubbing or tugging, that also leaves your lashes and skin moisturized? It's over here! Wow, I've never seen a mascara like this! At first glance it looks like something used to apply hair dye in a salon!